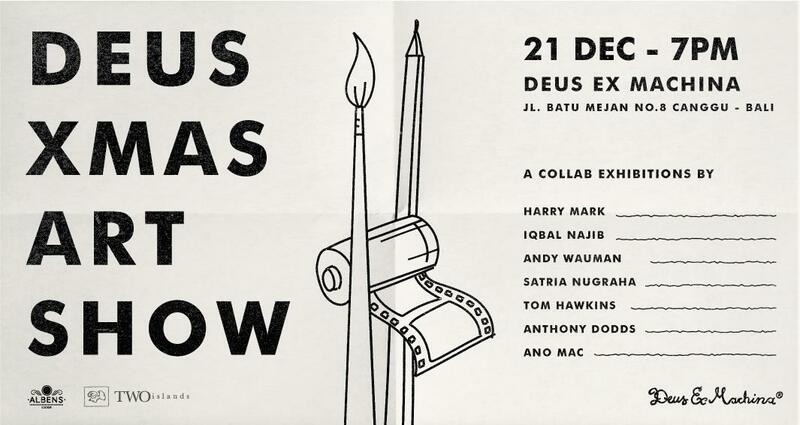 The Deus Xmas Art Show is a fixture on the Deus Gallery circuit for as long as we’ve had our open shingle hung out. It’s a time we offer up the Gallery space to our family and friends in an opportunity to show their talents. This year is no different from the past and we’re super happy to rip the curtain off of seven likely lads’ freelance foibles. Wouldn’t be a Deus show without the usual smattering of photographers work in there, We’ve got three. Harry Mark, Tom Hawkins and Anthony Dodds. Talk about triple banger barrels. All these guys have managed to suspend our disbelief with their photos all the while compensating for their over exposures for years. Our favourite dogmatic Belgian, Andy Wauman, has a trove of his own dead sea scrolls to show us. The runes inscribed etchings are demure and meant to lure. To where and when we are not quite sure. His art is a story untold or fortold or both.